A friend of mine organized a small gathering yesterday and we all took a vacation day to play games at his house. We all struggle with getting some of those unplayed, older, and rarely played titles to the table and these gatherings provide a great opportunity for us. I’ve said it many times before, but I’m always amazed at how few games we can play in a day. I always have unrealistic expectations of burning through stacks and stacks of games by the end of the day but, reality bites. We started the day with an unplayed title, Metropolys. The steam-punk reminiscent box art has always kept me wanting to give it a try. The game is really an abstract with some theme thrown in. The board depicts a map of a city with regions separated by canals. Each region is divided into smaller colored regions divided by streets. 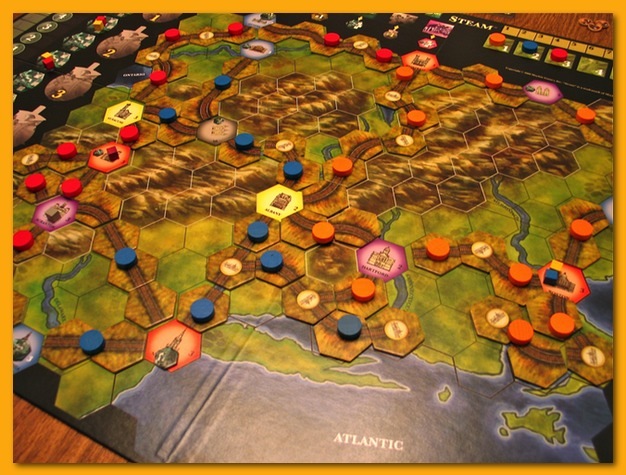 Tokens of various types are placed on some of the regions and your job is to take control of the small regions, vie for the good tokens (shunning the bad), as well as grabbing control of the larger canal-separated regions. Every player starts with the same set of 13 buildings (think Mexica) numbered 1 through 13. The start player places a numbered building in one of the small colored regions and subsequent players must pass or place a larger numbered building on a different colored regions that is adjacent to the last building bid. 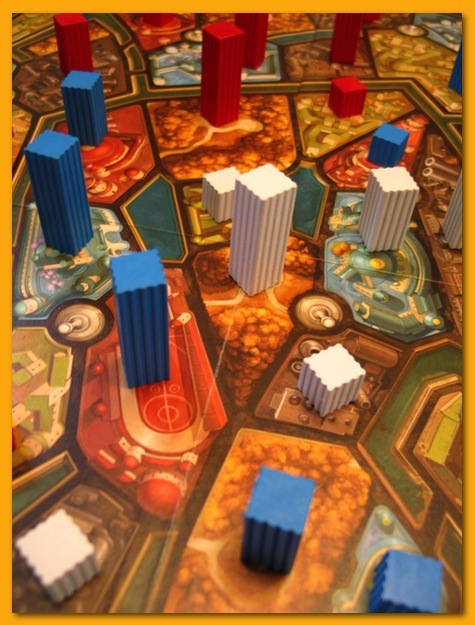 The winning bid grants the colored region to the player and the building is turned over and becomes permanent fixture of the board. Play continues until somebody runs out of building. Cards dealt randomly to players at the beginning of the game give players hidden goals that grant points if achieved (e.g. 4 points for each group of 3 connected buildings). It’s a very simple game that has it’s place as a opener or filler game. It’s relatively light but fun. The artwork is really great. 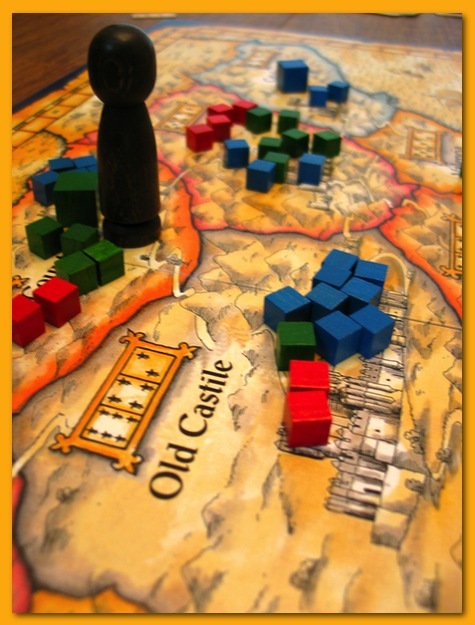 Next up was a really old title, El Grande. I’ve played it twice in the last 8 years (about 2-3 years apart) so, to stay on track, it was due. My fellow players were new to the game but I think they liked it. The game is very chaotic with the max number of played but was relatively controlled with the number we had. I was glad to get this area majority game back to the table after a long hiatus. I usually find myself fighting too many losing battles with too many different players but I stuck to my plan this time and it seemed to work. The power of grabbing second place in many places can really make or break you. Next up, was Steam. Stacked somewhere in my weirdness is the love/hate relationship I have with train games. I don’t like them, play poorly, and don’t understand why but yet, I find them intriguing. When I’m not playing, I want to play. However, when I am playing, I wonder why I want to continue. We were all new to Steam but I taught it and we got under way. As usual, I found myself having chosen poorly where to start and I immediately saw that I would be squashed between two players who quickly staked out large territory to the east and west greatly limiting my ability to effectively/efficiently branch out. I should have started multiple lines when I recognized this but was too timid. The game punishes you mercilessly for making the wrong decisions and rewards those that can pull ahead early. Mid-game, I found myself having to pass a couple of times on one of the steps of the Move/Upgrade phase because I had no cubes to ship. I was too scared to either start a new track and/or upgrade a town (new cubes!) or raise too much money just building trying to make something happen. Timidity is the path to destruction. In the end, we were separated by only a few points but each of those points were teased out of nothingness. I hate it. When can I play again! Next we grabbed a quick dinner; a giant burger that sat in my belly like a rock. I think the additional beer I poured on top helped immensely! We played a quick two-player hand of Haggis to remind ourselves how to play but then started thinking about what to play next. We thought about pulling out Container but the beer, the food, and the time started affecting our ability to grok a new set of rules so we decided to pull out Dominion and call it a night. We pulled a random set of cards from lots of different versions including the Prosperity Colony, Platinum, and Peddler cards. The early game was riddled with Pirate Ships and Thieves so Moats were in short supply. My stock of Quarry cards came in very handy. A thief stole my recently purchased Platinum card (!) but finally, my Explorer started paying off with a few Province cards I had and I ended up a solid second place. Dominion is good. That’s about all I can say about that. That’s about all I’ve got. Thanks guys, let’s do it again soon. When I heard about Quarriors, I had to get a copy for my collection. The game comes in a dice-like tin filled with a few cards and 130 custom dice. Yep, 130! 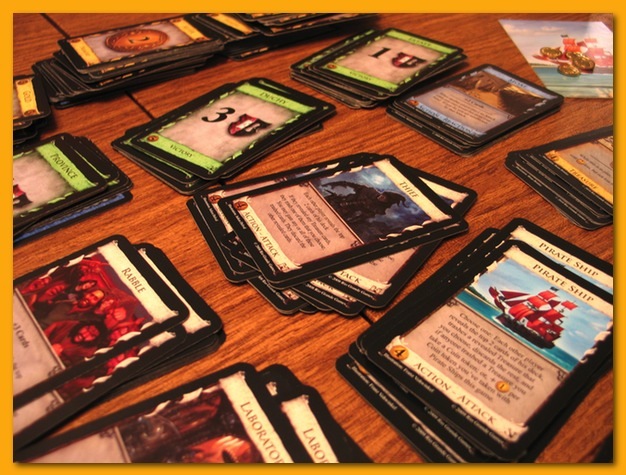 If you’re familiar with Dominion you’ll quickly pick up on this “deck” building game. Each player gets a bag and a few starting dice that act much like your fixed initial hand in Dominion. On your turn you draw a few dice from the bag, roll them, and use the “money” (Quiddity) to purchase more dice from the table to add to your bag. This purchase from the “wilds” parallels what happens in Dominion as well; instead of cards, you buy dice and anything you buy goes directly into your discard pile. In addition to your one buy, you also can use some of the money to summon creatures, attack other players summoned creatures, and cast spells that can help you attack, defend, and/or earn more points when you score. If at the beginning of your turn, you still have some creatures in play (they weren’t defeated) then you can score them and put them in your discard pile. Some dice allow you to re-roll dice and others allow you to draw additional dice from your bag for this turn. Again, like Dominion, when you can’t pull the dice you need for your turn out of the bag, you throw all of the dice in your discard pile into the bag, mix them up, and continue drawing. 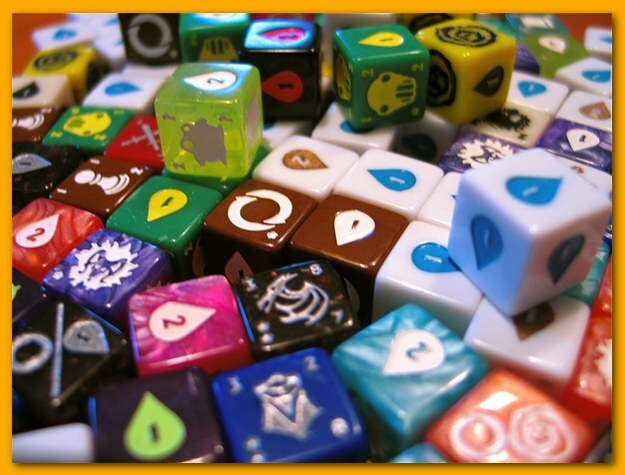 Each game is very different in that the dice available for purchase and what each die does changes from game to game. Before the game begins, three starting cards (in every game) are laid down, and three Spell cards are drawn randomly from the Spell deck, and seven Creature cards are drawn randomly from the Creature deck. 5 custom dice match each type of Spell or Creature so players find the appropriate dice and put them next to the cards, and the game begins. There are several cards of each type but the cards assign different features/actions for the faces of each die. This variability in the “wilds” makes the game very flexible. The expansion possibilities are almost endless with the first already in the works. Rise of the Demons adds 20 new custom dice and 19 new cards that introduce corruption mechanisms allowing players to sour other opponent’s decks to slow them down or to just be a trouble-maker. I like Quarriors but I do have my complaints. Besides the overly small bag, I thought I’d enjoy the lack of shuffling of the Dominion deck but you gather so many fewer dice in a game it never feels like you’ve amassed much of a deck. You just don’t get that constant touchy-feely with your deck that you do in Dominion. 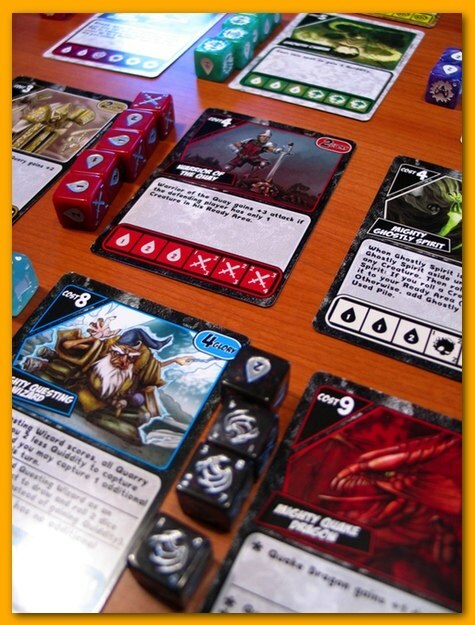 In Quarriors your points don’t pollute your deck and when you score, the game allows a culling operation which helps players sweeten their deck. I always feel like I don’t go through my deck enough times to offset poor dice rolls. Numerous times I’ve purchased a Creature only to have it always come up on the money side every time I roll it. At least in Dominion you can be guaranteed that if you buy a card, when it comes up in your deck you can count on it being functional. Quarriors is lighter with less decision than Dominion so it does make for a fast romp. If you’ve had a bad string of rolls, don’t sweat it. The game is over so fast you can try again on the next game. I’m looking forward to the expansion and to see what depth it adds.